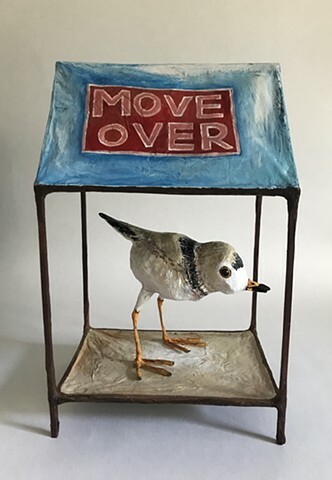 Move Over Piping Plover was created for 11th Annual Artist Bird House Auction. Organized by Karyn Mannix Contemporary, the 2017 auction is in memory of Don Saco, benefiting Lucia’s Angels and The Coalition of Women’s Cancers at Southampton Hospital. This piece is about the plight of the Piping Plover, a migratory shorebird who nests on the beaches of Long Island. Warning signs indicating roped off nesting areas for these endangered creatures are often ignored by thoughtless summer beachgoers.